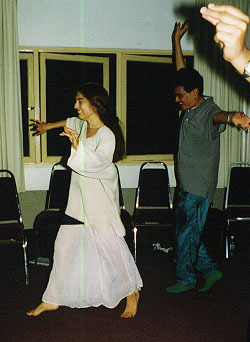 On December 19 thru December 22nd 1998 The World Spiritual Foundation held a World Congress Retreat at Fraser's Hill just north of Kuala Lumpur, Capital of Malaysia. The Congress commenced by the usual formal fanfare with an official Opening Address by the Chief Political Secretary to the Minister of Works, Government of Malaysia, Hon. Dato Seri S. Samy Vellu, who due to last minute urgent and important Governmental matters could not be personally present. This was followed by a welcoming dissertation by Bhai Sahib Ji after which short addresses by Representatives of each Courntry or State were presented. These were preceded by brief personal introductions by each Participant numbering 56 in all. 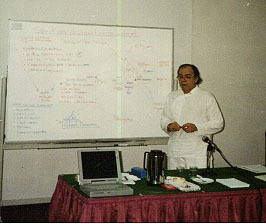 A very ably presented Keynote address with copious slides interposed by humorous anecdotes on the topic of "Wholesome Strategic Growth of WSF leading to World Peace and Harmony" was delivered by Sri Gurbakhish Singh of Malaysia, who was later nominated as Chairman of the freshly formed, FINANCE & ENTERPRISES Committee. A total of 25 most interesting Papers on a wide variety of topics were presented in correct sequence in the same order as bound in the Congress Booklet and as per the Programme Time Table drawn up. The Paper presentations were appropriately interposed by Bhai Sahib JiÕs Group Meditaitons which were of a profound and wholesome variety. In between, certain important topics pertaining to the VCM Advance Course were deliberated upon. Members doubts and difficulties in relation to VCM and related spiritual matters were also covered. We could not have chosen a better MC than Sardar Gorbex Singh who very enthusiastically introduced every Speaker and at the end, while thanking each Presentor, provided a cogent summation of each Paper. 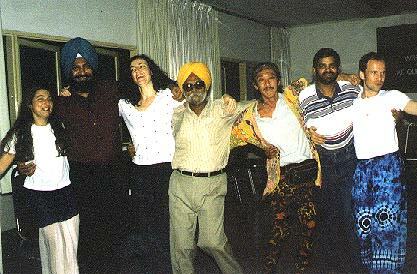 Although every Paper presented was exemplary in its own sphere of coverage, what stood out the most was the rendering by Willard Van De Bogart of USA who among other useful disclosures, brought to our attention Bhai Sahib's unique selection of the Congress dates of December 21st and 22nd 1998. These apparently concided with a significant Galactic Alignment which occurred during the winter Solstice of Dec 21 - 22 that happens only once in 26,000 years!! The Sun is then aligned with the Milky Way Centre, thus opening up an auspicious portal for more intensive Cosmic Consciousness on the Earth plane. Bhai Sahib selected these dates by the usual VCM discernment (testing) procedures and he was himself not aware of this significant Galactic Alignment occurrence. God truly guides us in strange ways! Mention should also be made of the Fun and Frolic we had every night, culminating with a hilarious Party Time and Dance on the final evening of Monday 21st December. A video Recording of almost the entire proceedings was filmed by David Michael Wong of Sydney which could be viewed in your leisure hours to re-create and re-live the wonderful spirit that prevailed during the entire Congress period. In future the "RETREATS" will come second to "CONGRESSES". Retreats would basically be held to cater to the National needs of the country concerned, whereas ÒCongressesÓ will be held Internationally every 2 years or so, depending upon the conveniences of the host country. An invitiation to have the next Congress in India sometime in the auspicious year of 2000 was unanimously accepted. The permanent twin Headquarters for WSF will stay in Kuala Lumpur and Sydney. There was a request by Mr Willard Van De Bogart that the announcement of the future Congresses and its dates, be sent to members as early as possible so that suitable preperations can be set afoot to attend these important functions. B. Proposed Formation of the "World Executive Council"
To lighten Bhai Sahib's burden, such a Council will take care of all Administrative and allied matters on an International level. The criteria of selection of its members be based upon the seniority of being opened into VCM basically but not entirely. For this first Council at least one Member from each Country is to be included. Although this would result in a largish number, such a selection was found judicious for the start. Later on, a smaller total number of Delegates will constitute the World Council. WSF main HQ to be in Kuala Lumpur where Bhai Sahib Ji is normally stationed. WSF should have its own Building or a permanent meeting place(s) exclusively used by us for VCM and related activities, Create Centres all over the world, preferrably having similar sort of facilities as in Kuala Lumpur, but somewhat sealed down to suit local needs. The "World Executive Council" formed should assist Bhai Sahib Ji to run all the Administrative affairs of the Organisation, thus sparing Bhai Sahib Ji to implement even more vigorously the spiritual ramifications of WSF. the formal Registration of the Foundation in each Country. the raising of Funds more vigorously and obtain Tax Exemption from the relevant local Authorities. That copies of the present Malaysian Constitution containing the Aims and Objectives and other associated matters be sent to all Centres for study and reference purposes. Each country may amend the Constitution to fit in with their local Rules and Regulations. Some members at the Congress received direct directions in their meditations that our Mentor shall in future be known as "Sri Bhai Sahib Ji", i.e. with the addition of the word Sri in front. Sri meaning Honourable. It was resolved to use this new format wherever feasible. Warren Simpson, Auckland, New Zealand. Fund Raising - Creating Multiple sources of Income. Breakdown of "Multiple Sources of Income"
To start a WSF (Society) Trust Fund. In acquiring of Religions funds, it would be easier and faster to get from the P.M.Õs office. To submit Application before 31/12/98 (31/12/99). To get support of Ministers such as Dato Samy Vellu, etc. Chaired by Mr. Willard Van De Bogart - USA. WSF to have its own special private Password. WSF to have a separate Web Site Page. A regular Newsletter to be put into diskette form and sent to Willard by E. Mail for further dissemination. Provide a list of all members with E-mail addresses. Explore the possibility of a Private Access for Finance & the WSF Exec. Council. Implementation requires selfless time and will be done by Donna and Willard. Registering an improved address on Internet to read, Òhttp://www. WSF.orgÓ the present one being too long. Marketing goods and services for WSF. The Australian Chapter to WSF website will be handled by Marc Floreani. Special time was set aside for Margaret Munro of Brisbane, Australia, to demonstate her brand of Pulsing, an extremely gentle way of Massage which releases chronic stress and strain, and at times even past tantrums and traumas to bring about an all round healthy wholeness. The entire procedure was filmed by David Wong of Sydney and formed an intergral part of DavidÕs Congress Tapes. Although there was also a clamour for viewing a Naam-Ri Healing demonstration, due to shortage of time this could not be formally arranged, not withstanding the fact that mutually amongst members, private Naam-Ri sessions were going on all the time. The Congress adjourned at 12.35 p.m on Tuesday 22 December 1998 with a formal recognition of certain members for their outstanding selfless contributions to WSF. There are however many more who have also rendered meritorious services, but to keep the numbers small, the following were called up to receive special accolades.